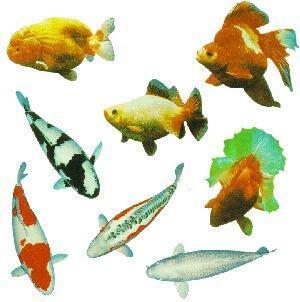 Note:- Ranchu is the Japanese name for Goldfish. Goldfish are smaller and slimmer. While Koi is the short Japanese word for carp. The carp is pleasantly shaped with their down-turned, moustache-like protuberances, like a Wiseman or a Sage. 1. The Chinese word for `fish' (yu) means `abundance, affluence'. So fish symbolises wealth. `Gold' as in Goldfish symbolises (jin) in abundance (yu). Year after year, may you live in affluence. The fish is one of the eight Buddhist Holy symbols. 2. Many geomancers recommend placing fish tanks in a home to symbolise good fortune. It is not advisable for a person with the fire element to own an aquarium (which represents water). However, some geomancers believe that if one belongs to the `Fire' element, it is good to have a fish tank in the home to help balance the `Fire' element to counter too much fire element in a person. One way to do so is to look at a person's `Pillar of Destiny' or his/her 8 characters. 3. Alternatively, some geomancers believe that a tank of black fish (e.g. goldfish) can be placed at an inauspicious place to ward off bad influences. 4. 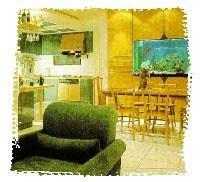 The best locations for placing the fish tank is in the North wall or along the South East wall. 7. What are the quantities of fishes to keep? Best to keep 1, 4, 6 or 9 fishes. 8. Can I keep other varieties of fishes? Even salt water variety? Yes, there is no reason for not doing so. But the salt water fish are harder to `maintain'. More work is needed. Other common types of fish includes: Angel fish and the arrowana (a tropical river fish also called the dragon-fish) is a graceful species of the carp. The arrowana fish likes isolation and if you are getting this fish, one will do. 10. The Carp and Perch are often seen in paintings and art pieces. The goldfish is another favourite fish found in paintings. Fish are associated with luck. 11. A pair of fish swimming together signifies marital harmony and a good symbol for newly weds. 12. Fish motifs can be found on the roofs of some temples to ward off fire. 13. 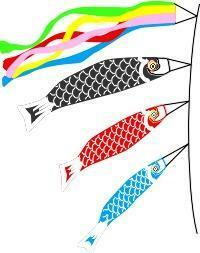 On Dragon boat festival on 5th day of the 5th month, carp-shaped flags are attached to bamboo poles. The wind blows the cloth carps to simulate the Carp struggling against the current. 14. The initials of Jesus Christ is IXOYE which is the Greek word for Fish. 15. It is auspicious to eat raw carp called `Yee-Sang' during the seventh day of the Chinese New Year which is also Everyone's birthday . 16. Avoid placing an aquarium in any bedroom or in the kitchen. Generally, it should be placed in the living or sitting room. 17. The best shape for an aquarium is rectangular or round.